Being an exhibitor at a trade show can be one of the most important moves your business makes. However, it’s also possible to spend a lot of money and walk away without getting the results you anticipated. In order to ensure that you get the most bang for your buck at a trade show, you’ll need a solid promotional plan for attracting visitors to your trade show display booth. By deploying strategies to maximize booth traffic, you’ll have greater opportunity to increase sales and achieve your show objectives. Attracting crowds is a matter of leveraging the power of natural human curiosity. If you can get just a few people to stop and gather round, the small crowd will naturally attract more and more people until you’ve got a large audience. This is the same phenomenon that brings traffic on a highway to a standstill for miles when a few cars slow down to gawk at even the smallest fender bender. With so much competition in the exhibition hall, you’ll need to devise a strategy that makes your trade show display booth stand out from the crowd. Here are three trade show booth ideas that have helped companies drive crowds of potential customers to their booths, capture the attention of important industry contacts, and generate media buzz. The Money Blowing Machine is an attraction that consistently stops people in their tracks anywhere it makes an appearance. 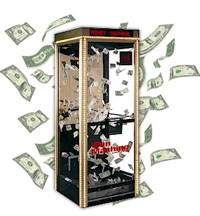 The money blowing machine looks a lot like a telephone booth – but with a lot more pizzazz. It's not the booth that gets people to stop and stare, but the hilarity of what takes place inside it. Contestants who step inside have 20 seconds to grab at the hundreds of bills or coupon vouchers swirling around inside. The spectacle is almost as much fun for everyone watching as it is for the person inside the money blowing machine. 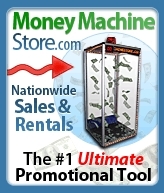 Offer visitors the opportunity to step into the money machine in exchange for filling out a contact card. Once inside the Money Machine, participants have 20 seconds to stuff as many bills or prize vouchers as possible into their Money Machine apron. Make arrangements for some of the "gurus" in your industry to participate in a cash catching challenge. Set a time and tell everyone who stops by to return for a chance to see the industry’s "top dogs" racing to collect cash inside the Money Machine. Allow participants to spin a "wheel of chance" to add another level of thrill and to reduce the number of participants that win the opportunity to try their luck at the Money Blowing Machine. 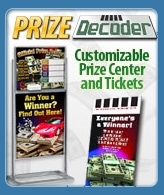 Customers who don’t win an opportunity to get into the Money Machine can win coupons, vouchers, and promotional ad specialties. A Prize Wheel or Wheel of Chance is one of the most versatile, portable, and effective trade show booth ideas and event marketing tools. The bright colors, sounds, and movement inherent of a Prize Wheel have a natural allure with crowds. 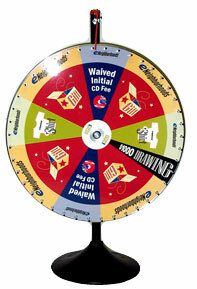 The Prize Wheel can be used not only at trade shows, but also at outdoor events and in-store promotions. 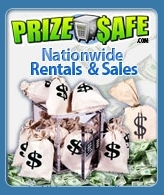 There are hundreds of ways to incorporate the Prize Wheel into games, contests, and customer retention marketing events. 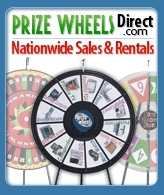 With its low cost and high versatility, a Prize Wheel is one of the most cost-effective marketing tools that a company can own. Give trade show participants an opportunity to spin the wheel in exchange for filling out a contact card. Customize your Prize Wheel so that every participant wins something – whether it’s a chance to step into the Money Machine, a customized ad specialty item, or a coupon for savings on your products and services. Use a floor model Prize Wheel and set it in front of your trade show display booth so that the colorful wheel is at eye level and arm’s reach when attendees walk by. Positioning the wheel close enough to touch increases the likelihood that people will stop for a spin. Have a personable attendant standing with the Prize Wheel at all times to greet trade show attendees and invite them to spin the wheel. The more personable and energetic your Prize Wheel attendant, the more likely people are to stop and engage in conversation. 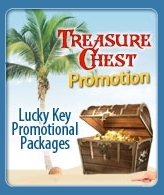 Ad specialties and promotional items are standard trade show booth ideas at any event. Because every booth and competitor will typically be giving away promotional items, it is essential that your ad specialties stand out from the crowd. Promotions expert Jonathan Edelman, president of Ideas4Now LLC, advises exhibitors to double the marketing power of ad specialties by choose promotional items that will be useful to people while they are at the trade show. When you give away ad specialty items that fill an immediate need for trade show attendees, they are much more likely to stop by and take one or try to win one. Following are ad specialties that work as powerful people magnets. For more ideas, click here for a free ideas catalog. A canvas bag printed with your logo gives trade show attendees a way to carry all the brochures and objects they’ve collected during the trade show. Because guests will carry your bag throughout the convention, this ad specialty doubles as a powerful moving billboard for your company. A refreshing private label bottled water is always accepted with a warm welcome by trade show guests who have spent the day doing a great deal of walking and talking. When you customize the label with your logo and company name, customers will carry it throughout the convention and do your advertising for you. Did you know that you could private label your own snacks? You can and it’s incredibly inexpensive. Hungry trade show guests will happily stop by for a bag of chips, pretzels, candies, or other snacks in package with your name on it. Guests appreciate your gesture of kindness and will often stop and chat for a few minutes to return the favor. This gives you the ideal opportunity to engage in a conversation and make those important connections. For more great trade show booth ideas designed to drive crowds to your exhibit area, visit Trade-Show-Attractions.com by clicking here: Trade Show Booth Ideas – Trade Show Exhibit Attractions – Event Marketing.